The SMCFS801P can provide up to 30 Watts of power to attached devices, such as VoIP phones, wireless access points, surveillance cameras etc, all over existing Cat. 5 cables. The switch can deliver up to 30 Watts on 4 ports, 15.4 Watts on 8 ports, or 7.5 Watts on 8 ports. SMC’s Green Saving implements a power-saving feature that makes your network environmentally friendly by automatically powering down ports that have no link. The SMCFS801P's simple design does not include any cooling fans, enabling the unit to run completely silently and reliably in whatever location it is installed. The switches are completely plug and play; no configuration is necessary. These plug-and-play switches are an ideal choice for integrating Fast Ethernet and boosting LAN bandwidth for small to medium-sized workgroups. Support for Auto-MDIX means that no cross-over cables are required. Straight-through cables can be used for all connections. 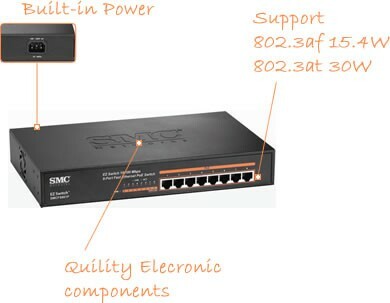 SMC Network's SMCFS801P 8-port 10/100M desktop PoE switch provides seamless network connection, integrating 100 Mbps Fast Ethernet and 10 Mbps Ethernet network capabilities. The PoE ports can automatically detect and supply power to IEEE 802.3af/at-compliant Powered Devices (PDs). PoE electrical power is transmitted along with data in a single cable, allowing a network to expand where there are no power lines or outlets, to where you want to fix devices such as APs, IP cameras, or IP phones, etc. The SMCFS801P is easy to install and use, requiring no configuration. 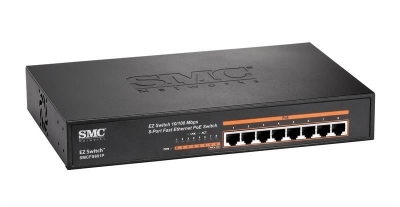 With a simple desktop design, outstanding performance and quality, the 8-port 10/100M desktop PoE switch is an excellent choice for expanding your home or office network. Please check www.smc-australia.com.au for the warranty terms in Australia.